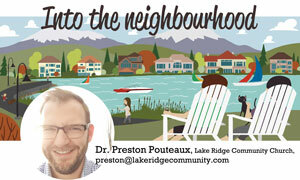 I was visiting with a neighbour who had never walked around the ponds in their community. I was surprised. The truth is that there are some people in Chestermere who have rarely been out and about to see first-hand many of the features of our city. People in Chestermere might be pleased to discover that our city parks, ponds, streams, and green spaces are more beautiful on foot than they might know. How we experience our place shapes how we embrace it. If we only see the main roads and the well-worn path to our garage door, then our imagination for our city might shrink. When we see and experience more of our city, we discover that we are a part of something beautiful. When I learned that my neighbours had not yet visited their local pond, I invited them to go with us for a walk. Together we walked through the neighbourhood and onto the pathways that meander through our community. We pointed out ducks, back-yard gardens, and enjoyed a long leisurely conversation. We’ve since become friends and I know their perspective on the community has changed. Engaging our place in new ways changes how we see others. One way to think about our community in a new way is to draw it. Yes, just like in school, with a real pencil and paper. In fact, researchers from the University of Waterloo, Ontario, have found that drawing something helps us remember it better. In my own work helping people see their neighbourhoods in new ways I have found that when people are asked to draw their neighbourhood, it reveals the ways in which we do, or do not, know details of our place. Do you know your street well? Could you describe it to someone who has never visited it before? You can test your memory by simply trying this exercise. Take a piece of paper and draw a big circle in the middle of it. Put a dot in the middle of the circle, that’s your front door. Now, using your memory only, draw your neighbourhood out from that spot. As though making a map, draw the footprint of your home, your yard, neighbouring homes and streets, the local park, and whatever else might be nearby. How well do you know your place? Are you discovering that your place is familiar to you or foreign? Do you know the details? For fun, ask a friend, your kids, your spouse, or neighbour to also draw your neighbourhood. How do your details compare to one another? What did you learn? For bonus points, take a few long walks through your neighbourhood and then try the exercise again. What changed in your drawings? Drawing our neighbourhoods often leads to other discoveries. Did you know that your place is unique to you? No one else experiences your neighbourhood and your neighbours in the same way that you do. That makes you an expert. You are growing to know your place and that’s exciting. What will you discover next? Every day holds the possibility of a new surprise when we live expectantly in our community. May you step into your neighbourhood with a fresh sense of discovery and possibility. As you draw your community, may you find new corners worth exploring and worth appreciating. Your neighbourhood is unique to you and it is your privilege to make it your own. As you draw and discover, may you also be drawn to others who love your neighbourhood, too. There is good around the next corner. What, and who, will you find today?